Henry David Thoreau (1817-1862) remains best-known for Civil Disobedience and for Walden, a beautiful ode to simplicity and self-sufficiency. Thoreau moved into a cabin he built by Walden Pond to extricate himself from social life and surround himself with the simplicity of nature. The book is a collection of his insights on a range of topics gained over the two years and a few months he spent there. The seclusion of Walden offered an opportunity for serious reading. My residence was more favorable, not only to thought, but to serious reading, than a university; and though I was beyond the range of the ordinary circulating library, I had more than ever come within the influence of those books which circulate round the world, whose sentences were first written on bark, and are now merely copied from time to time on to linen paper. … I kept Homer’s Iliad on my table through the summer, though I looked at his page only now and then. Incessant labor with my hands, at first, for I had my house to finish and my beans to hoe at the same time, made more study impossible. Yet I sustained myself by the prospect of such reading in future. I read one or two shallow books of travel in the intervals of my work, till that employment made me ashamed of myself, and I asked where it was then that I lived. It’s the labour of reading that makes it worthwhile. The student may read Homer or Æschylus in the Greek without danger of dissipation or luxuriousness, for it implies that he in some measure emulate their heroes, and consecrate morning hours to their pages. The heroic books, even if printed in the character of our mother tongue, will always be in a language dead to degenerate times; and we must laboriously seek the meaning of each word and line, conjecturing a larger sense than common use permits out of what wisdom and valor and generosity we have. The modern cheap and fertile press, with all its translations, has done little to bring us nearer to the heroic writers of antiquity. The classics are the noblest thoughts and require training. Men sometimes speak as if the study of the classics would at length make way for more modern and practical studies; but the adventurous student will always study classics, in whatever language they may be written and however ancient they may be. For what are the classics but the noblest recorded thoughts of man? They are the only oracles which are not decayed, and there are such answers to the most modern inquiry in them as Delphi and Dodona never gave. We might as well omit to study Nature because she is old. To read well, that is, to read true books in a true spirit, is a noble exercise, and one that will task the reader more than any exercise which the customs of the day esteem. It requires a training such as the athletes underwent, the steady intention almost of the whole life to this object. Books must be read as deliberately and reservedly as they were written. What is called eloquence in the forum is commonly found to be rhetoric in the study. The orator yields to the inspiration of a transient occasion, and speaks to the mob before him, to those who can hear him; but the writer, whose more equable life is his occasion, and who would be distracted by the event and the crowd which inspire the orator, speaks to the intellect and health of mankind, to all in any age who can understand him. No wonder that Alexander carried the Iliad with him on his expeditions in a precious casket. A written word is the choicest of relics. It is something at once more intimate with us and more universal than any other work of art. It is the work of art nearest to life itself. The best books are not read even by those who are called good readers. What does our Concord culture amount to? There is in this town, with a very few exceptions, no taste for the best or for very good books even in English literature, whose words all can read and spell. Even the college-bred and so-called liberally educated men here and elsewhere have really little or no acquaintance with the English classics; and as for the recorded wisdom of mankind, the ancient classics and Bibles, which are accessible to all who will know of them, there are the feeblest efforts anywhere made to become acquainted with them. It is not all books that are as dull as their readers. There are probably words addressed to our condition exactly, which, if we could really hear and understand, would be more salutary than the morning or the spring to our lives, and possibly put a new aspect on the face of things for us. How many a man has dated a new era in his life from the reading of a book! The book exists for us, perchance, which will explain our miracles and reveal new ones. We spend more on our bodies than our minds. We boast that we belong to the Nineteenth Century and are making the most rapid strides of any nation. But consider how little this village does for its own culture. I do not wish to flatter my townsmen, nor to be flattered by them, for that will not advance either of us. We need to be provoked—goaded like oxen, as we are, into a trot. We have a comparatively decent system of common schools, schools for infants only; but excepting the half-starved Lyceum in the winter, and latterly the puny beginning of a library suggested by the State, no school for ourselves. We spend more on almost any article of bodily aliment or ailment than on our mental aliment. Walden is a classic for a reason. 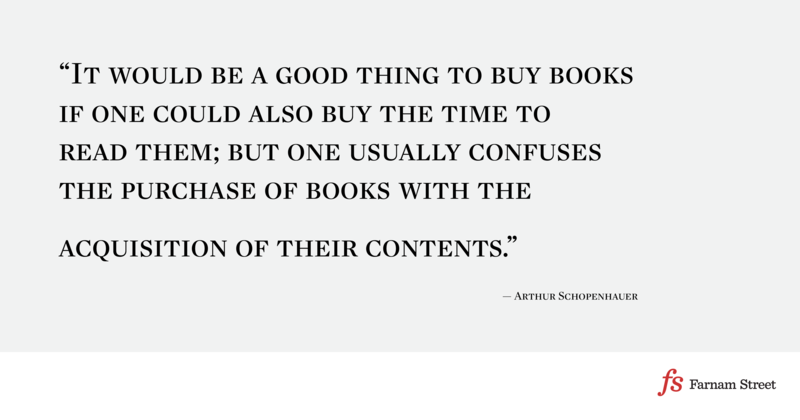 One of the most timeless and beautiful meditations on reading comes from the 19th-century German philosopher Arthur Schopenhauer (1788–1860). Finding time to read has never been an issue for me. I read different books at different levels — you don’t put the same effort into Harry Potter as you do Seneca. Reading is the best way to get smarter. And while I’ve always taken notes while reading to improve my ability to remember what I’ve read, I’ve had a nagging feeling that I was missing part of the work. Perhaps, I’ve been reading too much and reflecting too little. 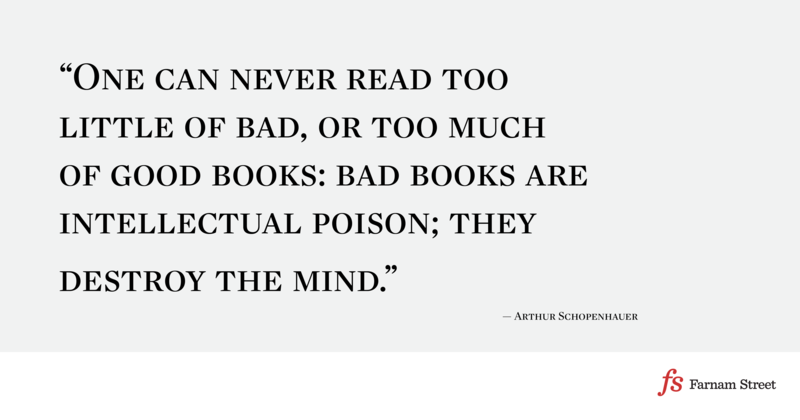 As I reflect more on the relationship between reading and acquiring wisdom, I discovered Schopenhauer’s classic On Reading and Books. For me, reading has always been about this website’s tagline: Mastering the best of what other people have already figured out. So it makes sense to start with the people that came before us. No matter what problem we face, odds are someone has faced it before and written about it. No need to start from scratch right? We return to the fundamental questions. What does it mean to read? Is reading the path to acquiring wisdom? If not why? These are the questions that Schopenhauer attempts to address. 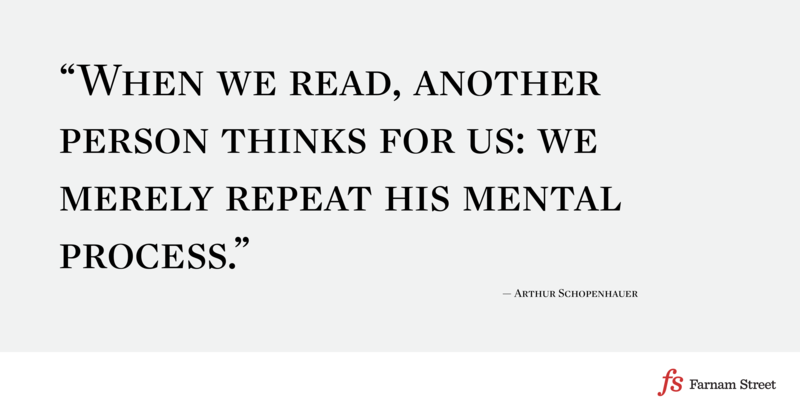 When we read, another person thinks for us: we merely repeat his mental process. It is the same as the pupil, in learning to write, following with his pen the lines that have been pencilled by the teacher. Accordingly, in reading, the work of thinking is, for the greater part, done for us. This is why we are consciously relieved when we turn to reading after being occupied with our own thoughts. But, in reading, our head is, however, really only the arena of some one else’s thoughts. And so it happens that the person who reads a great deal — that is to say, almost the whole day, and recreates himself by spending the intervals in thoughtless diversion, gradually loses the ability to think for himself; just as a man who is always riding at last forgets how to walk. Such, however, is the case with many men of learning: they have read themselves stupid. For to read in every spare moment, and to read constantly, is more paralyzing to the mind than constant manual work, which, at any rate, allows one to follow one’s own thoughts. Just as a spring, through the continual pressure of a foreign body, at last loses its elasticity, so does the mind if it has another person’s thoughts continually forced upon it. And just as one spoils the stomach by overfeeding and thereby impairs the whole body, so can one overload and choke the mind by giving it too much nourishment. For the more one reads the fewer are the traces left of what one has read; the mind is like a tablet that has been written over and over. Hence it is impossible to reflect; and it is only by reflection that one can assimilate what one has read if one reads straight ahead without pondering over it later, what has been read does not take root, but is for the most part lost. Indeed, it is the same with mental as with bodily food: scarcely the fifth part of what a man takes is assimilated; the remainder passes off in evaporation, respiration, and the like. From all this it may be concluded that thoughts put down on paper are nothing more than footprints in the sand: one sees the road the man has taken, but in order to know what he saw on the way, one requires his eyes. It’s important to take time to think about what we’re reading and not merely assume the thoughts of the author. We need to digest, synthesize, and organize the thoughts of others if we are to understand. This is the grunt work of thinking. It’s how we acquire wisdom. This is how we acquire foundational knowledge. The knowledge that allows us to pull forth relevance when reading and bring it to consciousness. Without this foundational knowledge, we are unable to separate the signal from the noise. No literary quality can be attained by reading writers who possess it: be it, for example, persuasiveness, imagination, the gift of drawing comparisons, boldness or bitterness, brevity or grace, facility of expression or wit, unexpected contrasts, a laconic manner, naïveté, and the like. But if we are already gifted with these qualities — that is to say, if we possess them potentia — we can call them forth and bring them to consciousness; we can discern to what uses they are to be put; we can be strengthened in our inclination, nay, may have courage, to use them; we can judge by examples the effect of their application and so learn the correct use of them; and it is only after we have accomplished all this that we actu possess these qualities. It is the same in literature as in life. Wherever one goes one immediately comes upon the incorrigible mob of humanity. It exists everywhere in legions; crowding, soiling everything, like flies in summer. Hence the numberless bad books, those rank weeds of literature which extract nourishment from the corn and choke it. They monopolise the time, money, and attention which really belong to good books and their noble aims; they are written merely with a view to making money or procuring places. They are not only useless, but they do positive harm. Nine-tenths of the whole of our present literature aims solely at taking a few shillings out of the public’s pocket, and to accomplish this, author, publisher, and reviewer have joined forces. There is a more cunning and worse trick, albeit a profitable one. Littérateurs, hack-writers, and productive authors have succeeded, contrary to good taste and the true culture of the age, in bringing the world elegante into leading-strings, so that they have been taught to read a tempo and all the same thing — namely, the newest books order that they may have material for conversation in their social circles. … But what can be more miserable than the fate of a reading public of this kind, that feels always impelled to read the latest writings of extremely commonplace authors who write for money only, and therefore exist in numbers? And for the sake of this they merely know by name the works of the rare and superior writers, of all ages and countries. Knowing what to read is important but so is its inversion— knowing what not to read. This consists in not taking a book into one’s hand merely because it is interesting the great public at the time — such as political or religious pamphlets, novels, poetry, and the like, which make a noise and reach perhaps several editions in their first and last years of existence. Remember rather that the man who writes for fools always finds a large public: and only read for a limited and definite time exclusively the works of great minds, those who surpass other men of all times and countries, and whom the voice of fame points to as such. These alone really educate and instruct. Oh, how like one commonplace mind is to another! How they are all fashioned in one form! How they all think alike under similar circumstances, and never differ! This is why their views are so personal and petty. There are at all times two literatures which, although scarcely known to each other, progress side by side — the one real, the other merely apparent. The former grows into literature that lasts. Pursued by people who live for science or poetry, it goes its way earnestly and quietly, but extremely slowly; and it produces in Europe scarcely a dozen works in a century, which, however, are permanent. The other literature is pursued by people who live on science or poetry; it goes at a gallop amid a great noise and shouting of those taking part, and brings yearly many thousand works into the market. But after a few years one asks, Where are they? where is their fame, which was so great formerly? This class of literature may be distinguished as fleeting, the other as permanent. But reading good works is not enough. We must re-read important works immediately because it aids our understanding, a concept that Mortimer Adler echoes. And the final part of the essay I want to draw your attention to speaks to how advancement happens in a flurry of false starts, and answers the age-old question of why so many luminaries — whether scientific or even artistic — fail to be recognized in their present age as they will later come to be seen by the world. … imagine the progress of knowledge among mankind in the form of a planet’s course. The false paths the human race soon follows after any important progress has been made represent the epicycles in the Ptolemaic system; after passing through any one of them the planet is just where it was before it entered it. The great minds, however, which really bring the race further on its course, do not accompany it on the epicycles which it makes every time. This explains why posthumous fame is got at the expense of contemporary fame, and vice versâ. If you think Schopenhauer is for you, pick up a copy of The Essential Schopenhauer: Key Selections from The World As Will and Representation and Other Writings. Theodore Roosevelt was perhaps the most well-read president. On a normal day he’d read a book before breakfast with another two later in the day. This puts my reading habits to shame. Over his life, he read thousands of books.